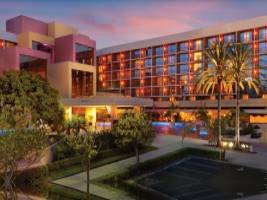 Costa Mesa hotel located near Orange County Airport Hilton Orange County/Costa Mesa is near Southern California attractions and beaches. Whether you’re here on business or leisure, our hotel has all you need to make the most of your stay, including a complimentary John Wayne Airport shuttle, 48,000 sq. ft. of event space for Costa Mesa weddings, and signature cuisine at our Bristol Palms California Bistro.